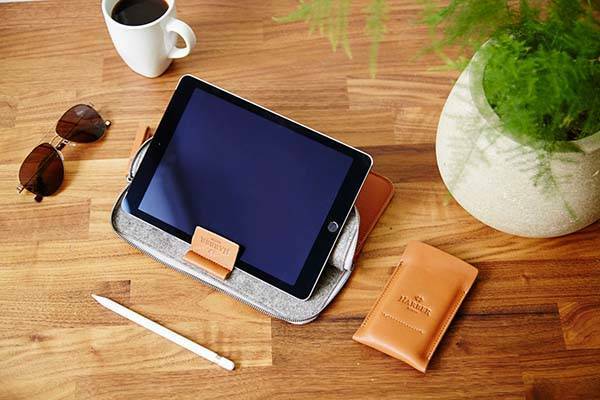 No one wants to take the premium tablet without any protection, so we introduce the handmade EVO iPad Pro leather case to hold the tablet in style, and integrated Smart Keyboard and Apple Pencil holder keeps the iPad Pro essentials together. This is a well-crafted and eye-catching leather case that comes in two models for both 9.7″ and 12.9″ iPad Pro models. As we can see from the images, the iPad Pro case shows off a minimalistic and smooth appearance, and two optional colors add some personalized style to the leather case. Moreover, the iPad Pro case is made from full grain vegetable tanned cowhide leather which delivers us classic and luxurious aesthetics, while the meticulous stitching and matching thread not only enhance the durability of the case, but also add some charming detailing to the case. 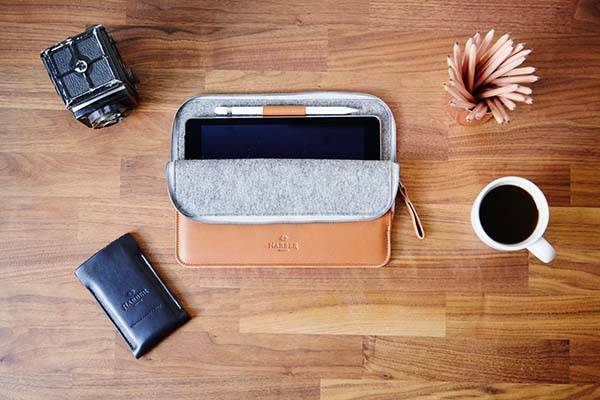 In addition to a genuine leather exterior, the iPad Pro case also features a soft padded 100% wool felt lining in order to securely hold your iPad Pro when you’re on the move with it, and ample compartment and built-in Apple Pencil holder allows it to hold your Smart Keyboard and Apple Pencil. Furthermore, the tab beneath the Apple Pencil holder acts as an iPad stand supporting handsfree viewing in landscape mode, and its smoothened metal zipper teeth prevents your tablet from getting scratched. The handmade iPad Pro leather case is available in two models and two colors for $107.57/$121.19 USD respectively. If you’re interested, jump to Etsy for its more details. BTW, also don’t miss Grapher Folio iPad Pro case and more related cool stuff by following tags.